Leaving New Mexico for one day in Texas and I had great plans: a brief visit to a nearby reservoir and then cycling about 20 miles from the second SAG stop to the border and back. But I have discovered on this trip how quickly plans must be changed. I think I should change the F in my middle name from Frances to Flexibility! The heavy truck traffic on the one lane highway and the strong headwinds already made me sceptical about my designs. And when I learned that there was an excellent hiking path along the reservoir, the decision was made: I'll hike today. The Ute Lake Reservoir is the largest weir dam in the world outside of China. I learned that with a weir the water flows over the construction, while with a dam the water flows over a spillway. I was enjoying the quiet and the gentle breeze (a cousin of the nasty headwinds the group were suffering) when above me I spotted dog tails wagging away. Suddenly two enormous chocolate labradors came charging down the path barking at me. They scared the sh..., I was very frightened and shouted at them - in German, of all things! The owner came along quickly apologizing and saying that the dogs were really lovely lap pets. The guy was on his way to pick up his parents, who were visiting at the nearby campgrounds. On returning from my beautiful outing we met again and I made friends with Samson. With perfect Steiner timing, I caught up with the gang at the photo op at the Texas border (see above). At dinner this evening everyone was quite subdued. 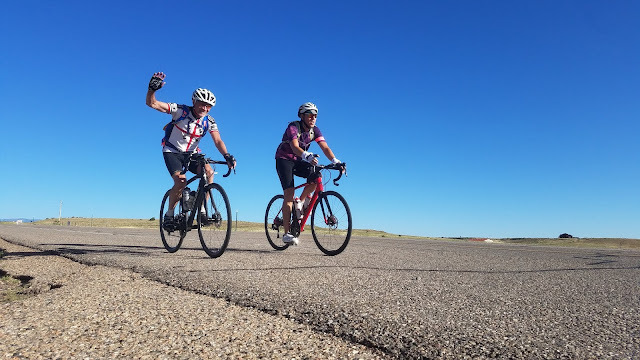 91 miles on dishearteningly straight roads, insistent headwinds and still 110 miles echoing in their legs from yesterday were reason enough to be just a little bit tired. When I asked Emil what he felt, he said he was so grateful to have a fantastic group of people to cycle with. They made the day enjoyable.